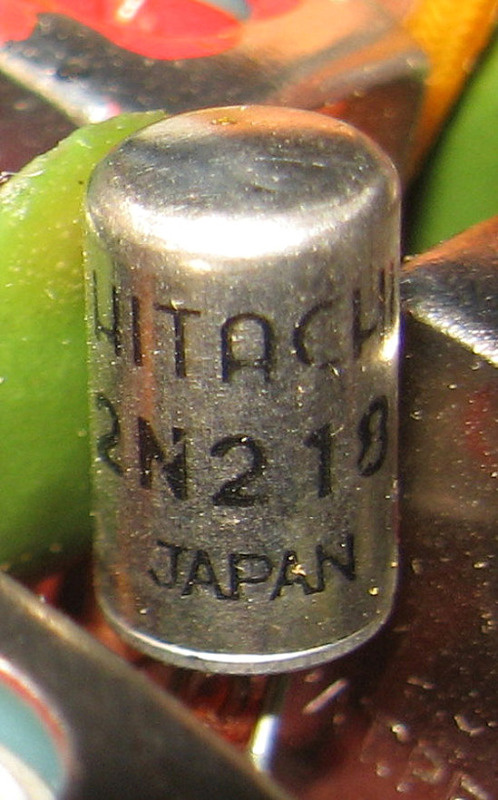 The Hitachi TH-667 was manufactured in Japan and released in May 1958. 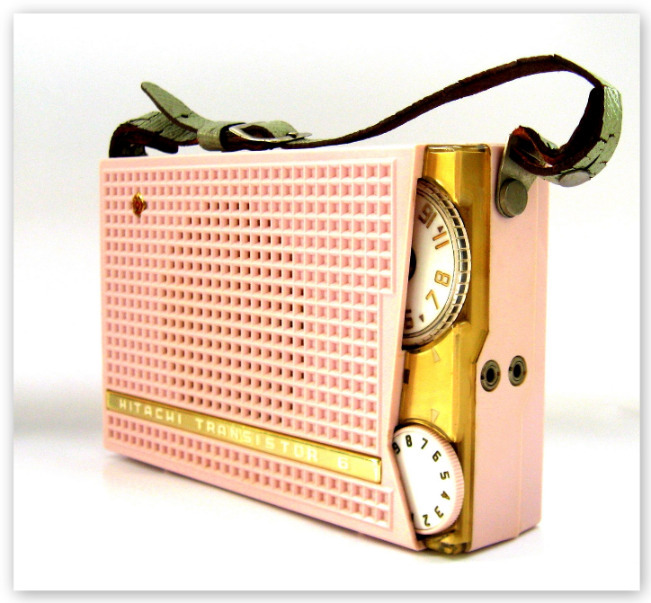 This is a true pink radio, unlike some from this era that were called pink but were actually peach colored like my Westinghouse H695P8. "A whole U.S. consumer market is threatened, U.S. firms contend, by the flood of neatly packaged, competitively priced transistorized portable radios bearing the 'Made in Japan' label." 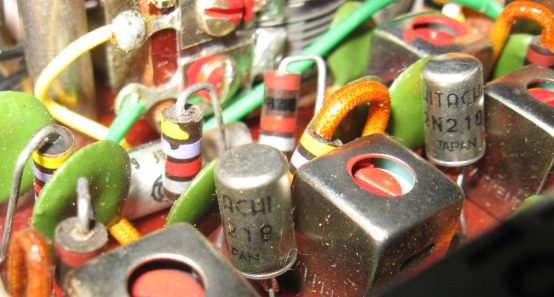 After WWII, and with the help of United States technical expertise, Japans electronic industry had risen to be the fourth largest in the the world. Exports fueled this growth, principally to America who accounted for 50% of Japans consumer electronics shipped overseas. 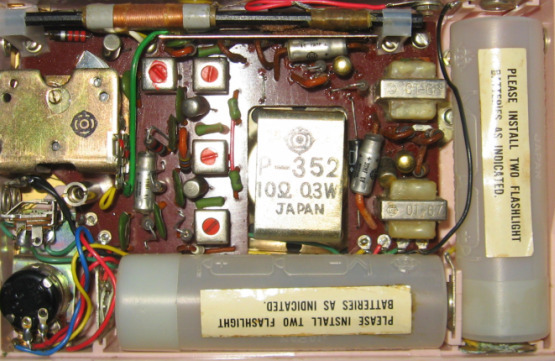 By this time Japan had captured about 25% of the domestic American market in transistor portables. 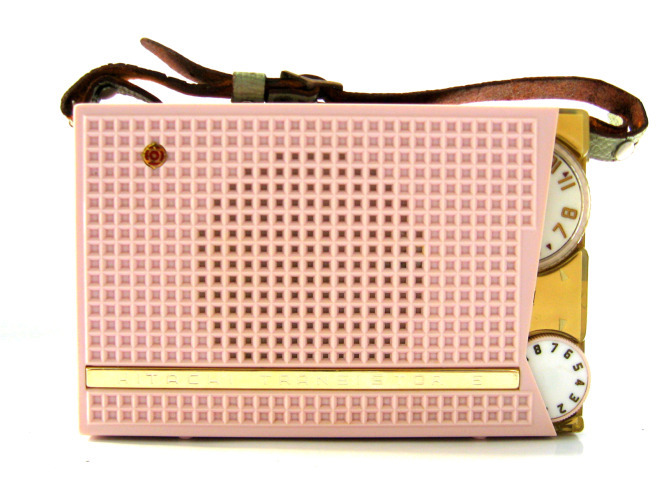 Japanese transistor radios were well designed and marketed and they were very economical in comparison to locally made products. Labor costs in Japan were about one fifth of what they were in America. In an effort to safeguard their industry a group of American manufacturers including Arvin & Sylvania complained to the 'Office of Civil and Defense Mobilization' that "the free wheeling Japanese invasion is undermining the defense capacity of U.S industry". A somewhat outlandish claim that was unsuccessful. 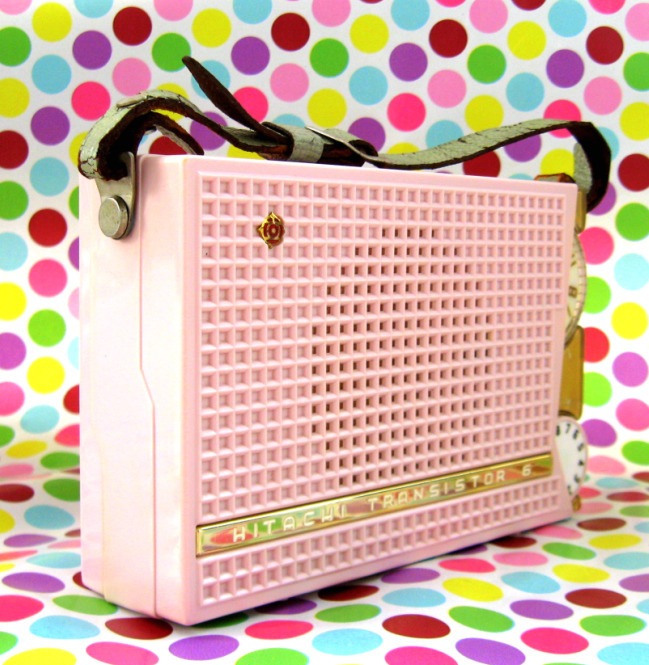 The writing was on the wall and it was a case of sink or swim for local industry so in an effort to stay afloat American companies began working with Japanese manufacturers and 'Made in Japan' began to appear on American radios. This was a desperate measure but one that ultimately prolonged the decline of the domestic American manufacturing industry. Ref: Billboard Magazine November 30 1959. Yes, a compact portable and table model to. Just 6-11/16 x 4-5/16 x 1-3/4. Big 3-1/2" speaker. 6 transistors, diode and thermistor; vernier fine-tuning dial. Shatterproof cabinet Blue, Pink or Green. The above ad for the Hitachi TH-667 appeared in a December 13, 1959 edition of the Reading Eagle. 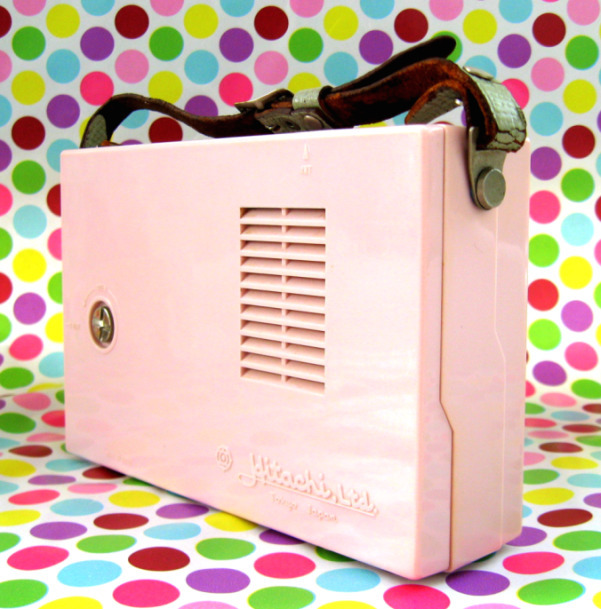 This Hitachi TH-667 features a large gold under-painted face cut from a shallow, understated chevron in the pink cabinet. 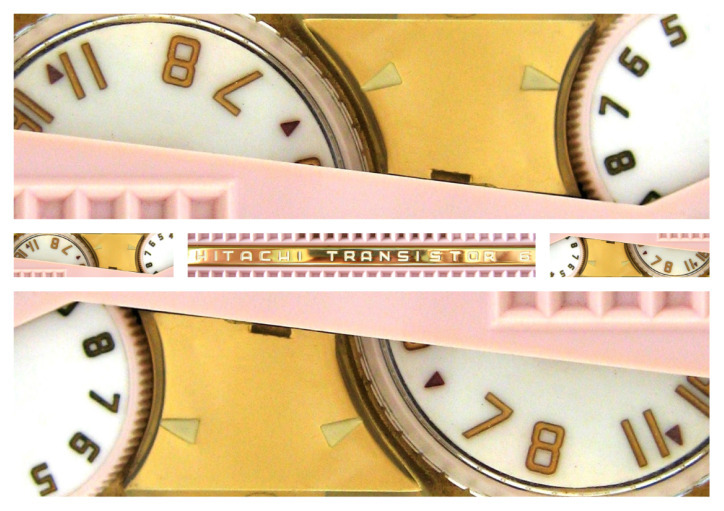 The vernier fine-tuning dial is not under-painted but is protected under clear plastic and it gives the same effect. The tuning dial and volume knob are recessed and set nicely into the gold face. 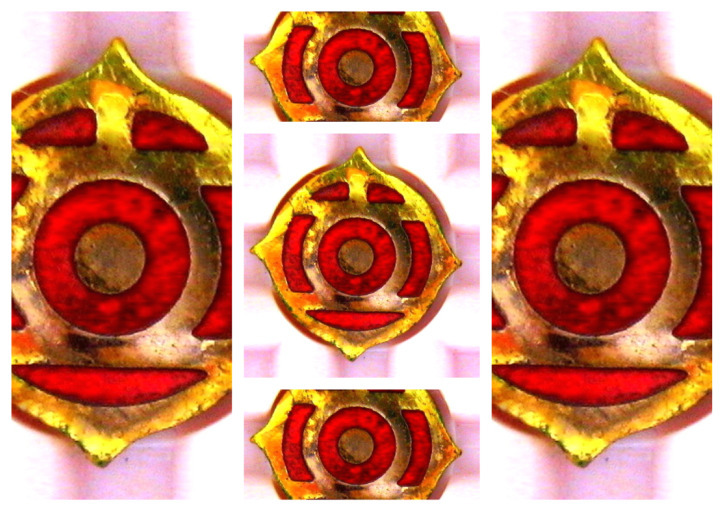 It has the small Hitachi badge in gold and red on the front and a gold metal strip that reads 'HITACHI TRANSISTOR 6'. 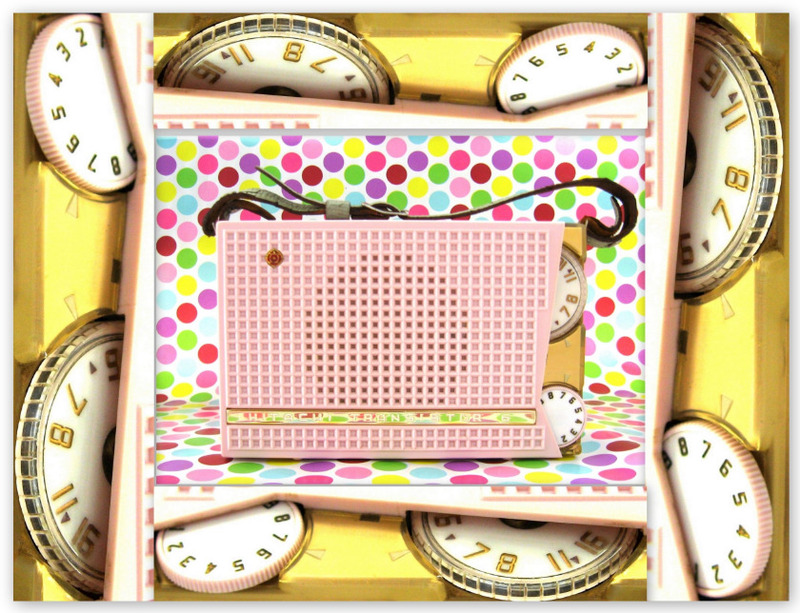 I like the design of this radio. The color is fantastic and the small square cutouts on the speaker cabinet combined with the gold face give it a simple, elegant look. It is a timeless piece of radio art. 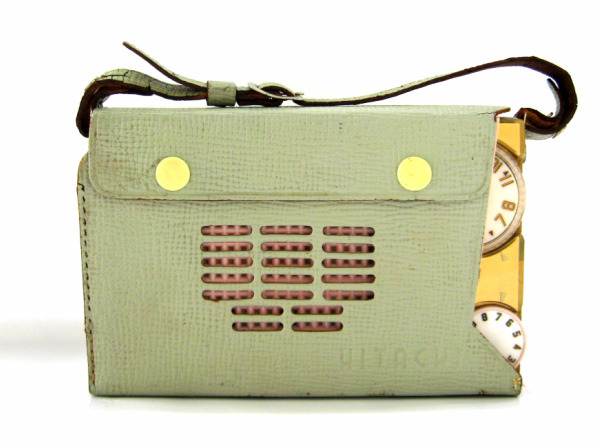 The leather carry strap is often missing from these radios as it deteriorates over time. 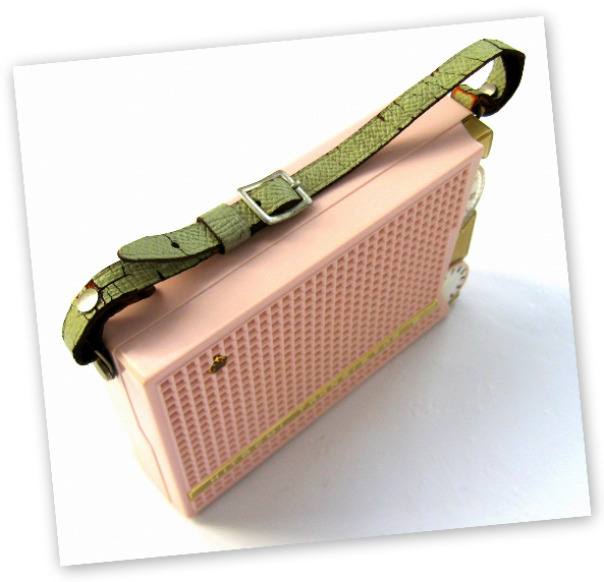 The strap and the leather carry case are the same light olive green color. 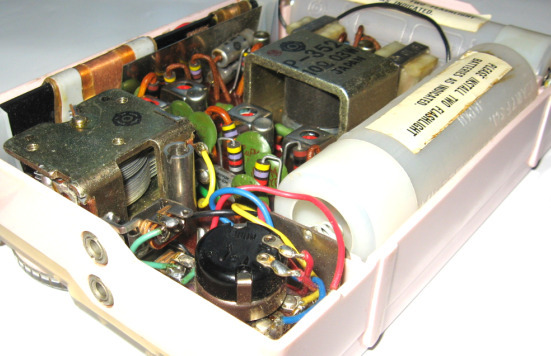 This TH-667 makes use of 6 Hitachi transistors. 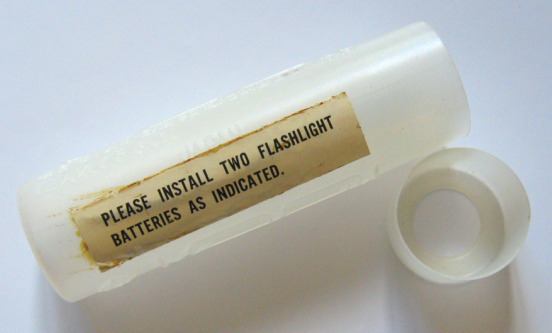 It uses two unique plastic battery cases with a removable cap at each end. Very helpful in preventing battery leakage and associated damage to the circuit board.